New Jersey CZT Liza Kostic is back today with her 8 Double C tangle. Liza recently shared her Leading Heart tangle with us. This pattern was inspired by a picture I came across as I was, as my kids like to call it, “shopping for patterns” on the internet. Normally, my tangling styles involves using one tangle as the “String” and filling its empty spaces with other tangles. 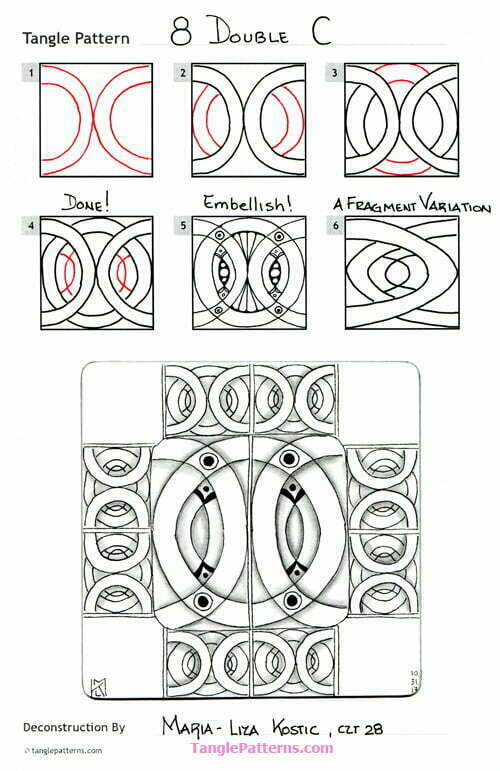 I think of this process as “entangling” and the end result as “entangled”. I am also drawn to grid tangles and symmetry. Due to arthritis in my hands, I find it difficult to draw small details on a 3.5 inch tile so I tend to draw mostly monotangles or duotangles, and occasionally a tri-tangle. I also tend to “borrow” elements of tangles if that element fits into a space I want to fill. I call these elements “Zen-bits”. I am not sure if the use of those bits would be considered, technically, a tangleation. The tangle gets it name from husband Andy. As he has always been my most staunch supporter, I gave him the honor of picking a name. This is Liza’s Zentangle tile featuring 8 Double C where she’s filled its spaces with Zen-bits of other tangles as she described above, using it as the tile’s string. My example of 8 Double C is somewhat different from Liza’s tangle. I got as far as Step 3 and didn’t have room to add Step 4. Then as I was contemplating what I’d done so far, I felt compelled to fill in the background C’s. It’s strangely interesting …. Liza illustrates the step-by-step instructions for drawing 8 Double C below. Have a great weekend, y’all! Mine is filled with antihistamines, eye drops, and tissues – it’s allergy season in South Florida! What a unique idea…Beautiful !! OOh! I like this one. Sooo many possibilities. Thanks for sharing. Looks really fun, I like this new pattern very much. Thank you for sharing. This will be a fun one. Thanks. Great tangle Liza!! Congrats! I look forward to trying it. And I love your “zenbits” word. Hi Liza, I too have hand issues and so I am really excited about your tangle. 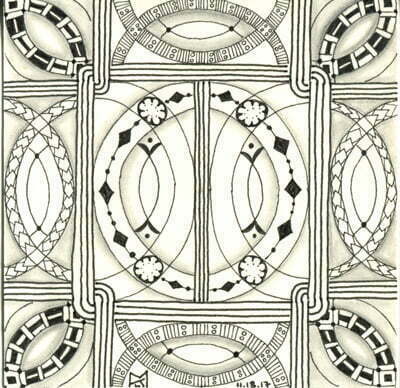 I am also great lover of everything Celtic and Art Deco, so this pattern really fills that need.